This project evaluates the use of laser-ablation technology to vaporize portions of tiny gold grains so that a mass spectrometer can then measure alloyed elements contained in gold grains (LA-ICP-MS). The presence of certain elements and their relative abundance is useful for linking loose gold grains back to a possible source. Although detrital gold (placer or loose gold grains) is common in BC, its origin is often unclear. Techniques for linking gold to a source are important to understanding where and what types of mineral deposits might exist in an area. Typically, alloyed elements in detrital gold are measured using an electron microprobe (EMP) that forms part of a “microchemical analysis” alongside mineral inclusion data. EMP is most effective in characterizing silver content; however, EMP has limited ability to detect other elements that may appear in low concentrations within gold grains. Laser-ablation inductively coupled plasma-mass spectrometry (LA-ICP-MS) has potential to measure a greater number of elements in low (sub parts-per-million) concentrations. This study evaluates the potential for using LA-ICP-MS to measure trace amounts of alloyed elements in detrital gold, which could clarify a source and the nature of mineralization in an area. provide the first large-scale dataset of trace elements found in gold, and an ability to compare the elemental make up of gold found in different styles of mineralization. 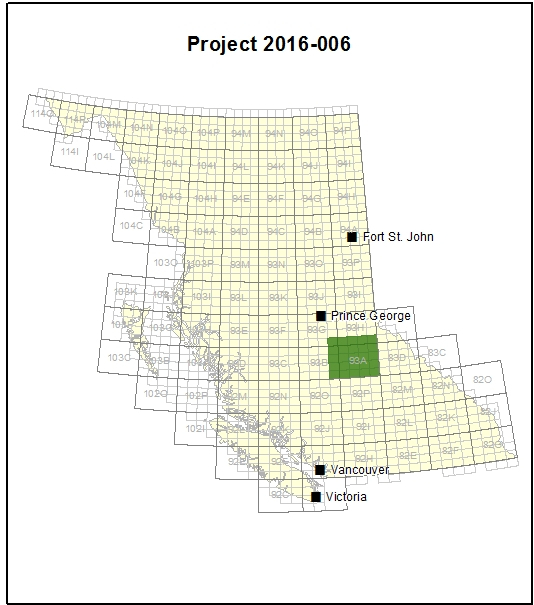 The project is evaluating a low-cost, early-stage exploration methodology that would form a valuable addition to the suite of techniques available to explorationists in BC. LA-ICP-MS may be a suitable, low-impact, and efficient method for validating the source of detrital gold based on measuring the trace amounts of alloyed elements. Mineral exploration companies generally target in situ mineralization, where the processes that led to development of the mineralization can be determined directly. However, efficiently analyzing detrital gold and linking it to an in situ source or deposit type can be difficult. Developing a technique to predict this relationship would assist mineral exploration in British Columbia. While microchemical analysis has been used since the 1980s, the method often requires a larger number of grains than are usually found in field samples. An analytical method, such as LA-ICP-MS, that can reduce the number of grains required to establish the source of the gold would eliminate this barrier. Detrital and bedrock gold grains used in the project come from four areas: Kamloops, Princeton, Prince George, and the Cariboo region. Mount Polley mine, Cow Mountain vein and placer creeks in the Cariboo region. Most of the samples for this study are from in-house inventories assembled by the researchers during previous field campaigns. Detrital and bedrock-liberated gold grains are mounted in resin blocks and polished to reveal the core of the gold grain. Images of the polished block surface are then used to identify each grain within each sample. This allows researchers to correlate the microchemical data from the gold grains with data obtained by LA-ICP-MS.
LA-ICP-MS is used to measure the trace amounts of alloyed elements in individual gold grains. Statistical analysis are then employed to appraise which elements would be useful in distinguishing between different mineral deposits. Gold grains from bedrock source provide a reference for a deposit type, to which the detrital grains can be correlated. Preliminary findings demonstrated that measurement of trace amounts of alloyed elements in gold grains using LA-ICP-MS might be useful for constructing multi-element templates for comparing gold grain clusters from different locations. This included results that suggested that gold found in alkalic porphyry deposits can be distinguished from gold found in orogenic systems by much higher concentrations of trace elements, particularly palladium, copper, and mercury. Further study had researchers compare two types of LA-ICP-MS techniques (quadrupole and Time of Flight) and statistical analysis to accurately identify and quantify the trace elements. They found that some microscopic minerals (e.g.pyrite) within the gold grains act as ‘sinks’ for certain trace elements. This mix of trace elements varies according to source style of mineralization and can help to identify the host gold grain’s source. New findings in the report have further revealed that gold grains are very heterogeneous in terms of trace element distribution and that interpretations of overall alloy content or source must be made carefully made. That heterogeneity allowed the researchers to speculate that larger populations of gold grains may in fact be necessary than first anticipated.